In Automatically Publish to Your List, I discussed how your site has what’s called an RSS “feed”. We used that feed as a way for an email service like Aweber to notice when new posts are published, automatically get the new post from the feed, and send it to your mailing list. The example site I used was Not All News Is Bad (NANIB). To send to the NANIB mailing list, I need do nothing more than publish a new post; the rest is automated by virtue of using that feed. However, RSS feeds can be used for good or evil. They can be used to automate things like mailing lists (good), make it easier and more convenient for the interested to consume content (also good), and make it nearly trivial for thieves to steal and re-publish the content you just poured your heart and soul into (evil). Most websites that publish content on a regular basis have RSS feeds of some sort to make it easier for consumers to consume their content. 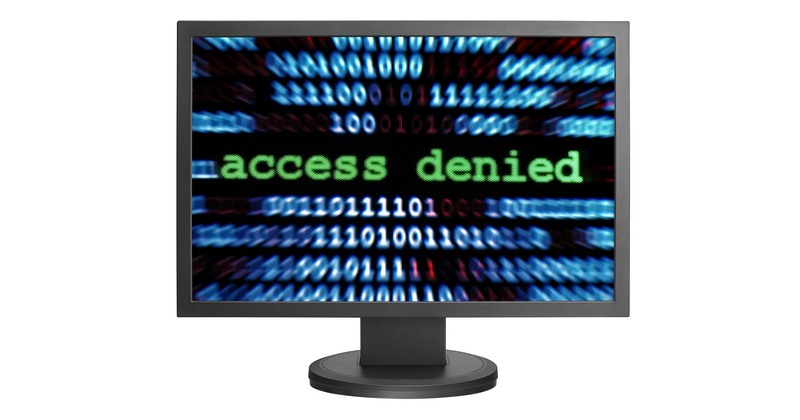 By using a special application or service called a feed reader, individuals can easily monitor updates to any number of websites they might be interested in. When new content appears on a website, the feed is updated, and a short while later, it’s picked up by the feed reader, which notices there’s something new. If you’re using a feed reader, you can choose to read whatever is included in the feed (more on that in a second), or you can click through to the website where the content was published, or you can simply ignore the update, if it’s not something that seems worthy of your time. I currently use Feedly to monitor almost 150 different feeds. Rather than running around to 150 different websites every day to see if there’s something new, I just fire up Feedly to see the list of what’s been published since the last time I checked. 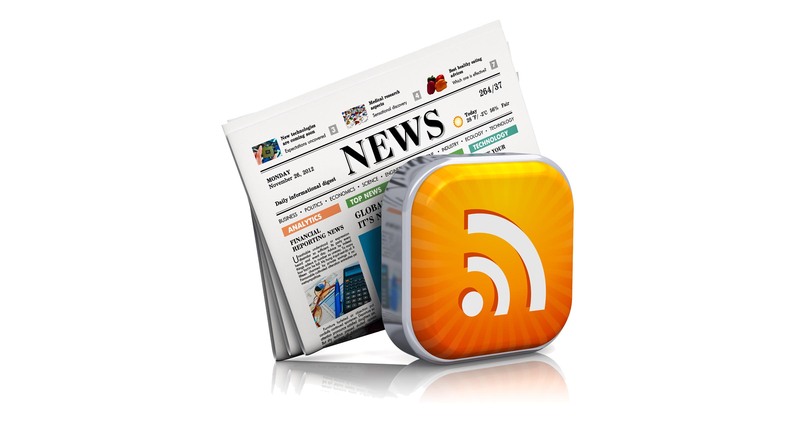 RSS feeds are awesome, and, in my opinion, severely undervalued and underused. However, they have a problem, and it’s a problem that impacts me directly as a website publisher. Honestly, content theft is going to happen. There’s really no way around that, but RSS made it easy. While it’s not the massive problem it once was (thankfully, Google does its best to down-play duplicate content sites), it remains an issue. Aside from not having an RSS feed at all (something I would not recommend, as it decreases your visibility) and knowing that theft will happen, there are two compromises or solutions that have been developed over the years. If you’re using WordPress, which I’ll continue to use as my example, in Settings, Reading is an option to include either full text or a summary of your post in your feeds. Full text, as you might expect, displays the full text of your article or post. The Ask Leo! On Business feed (https://biz.askleo.com/feed/) is configured this way. You can read the full text of any article as it’s published by subscribing to that feed in a feed reader. You need never visit the site. Summary is the compromise. Rather than including the full article, only a summary, or excerpt, is placed in the feed, along with a link back to the webpage on which the full article can be found (typically preceded by “Continue reading…”). Ask Leo!‘s feed (https://askleo.com/feed) is configured this way. If you subscribe to that feed in a feed reader, you’ll get the first portion of the article, with a link to the Ask Leo! web page containing the rest of the article. By selecting “summary”, all those sites stealing content end up becoming virtual advertisements for the main site. Regardless of how people find those sites, if they want to read the full article, they still need to click through to be taken to the canonical web site. As compromises go, it’s pretty clean, and in a sense puts the thieves to work for you. However, there are what I’ll refer to as “RSS purists” who believe — sometimes strongly — that the RSS feed should always and only contain the full text of the article… which brings us back to the original problem. This isn’t as much a “solution” as it is making the original content source blatantly obvious, regardless of where it’s posted. If you already use RSS feeds to monitor content, you may notice an extremely common characteristic of many feeds. Each article ends with “The post <title> appeared first on <blog title>”, where both titles are links (to the post and to the blog, respectively). This is due to the default configuration of the extremely popular Yoast SEO WordPress plugin. Among many other SEO and structure-related tweaks, the plugin adds that statement to the bottom of every feed entry. While this doesn’t prevent your content from being copied, it ensures that proper attribution to your website goes along with that copy. The setting in Yoast can be modified. 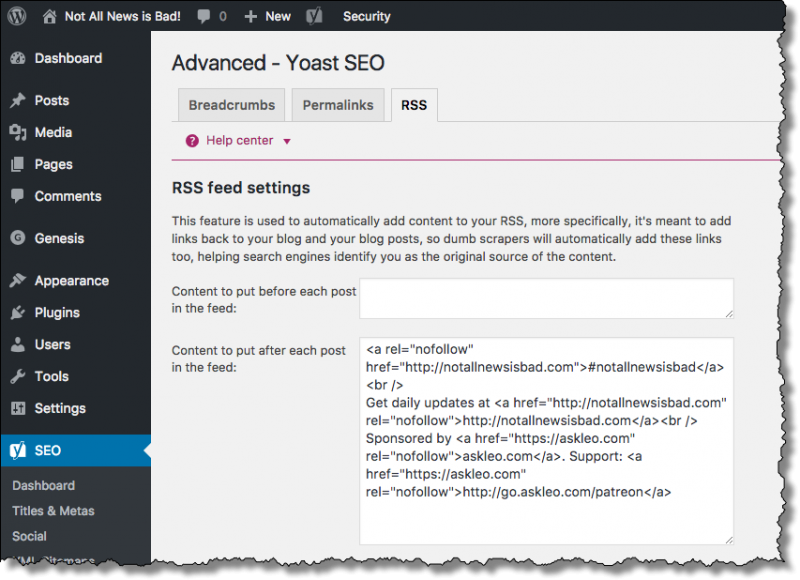 In SEO, Advanced, RSS settings is a option to define “Content to put after each post in the feed:”. The example above shows how I’ve customized it for Not All News Is Bad. The bottom of each feed item now includes a link to the site and sponsorship information — a kind of Ask Leo! “ad”. In a prior post, we also showed how feeds could be used to automate social media posting, and that’s part of what drove me to customize the RSS feed in this manner. 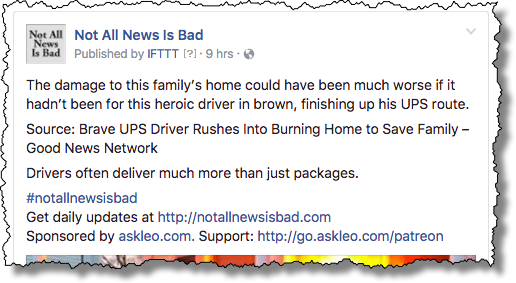 Now, when a Not All News Is Bad post appears on Facebook, for example, that information is included. The biggest decision you’ll make when configuring your website for RSS is whether or not to include full content in your feeds. The answer varies depending on exactly what you’re attempting to accomplish with your site and how you want people to consume your content. If you use a plugin like Yoast, the default changes it makes to your feed are probably fine. As you can see, however, if you want to get fancier, and perhaps as part of a larger automation such as social media, you have the option to leverage your feed in a multitude of ways.